Entrance to St. Mary's Hall. Image available on the Internet and included in accordance with Title 17 U.S.C. Section 107. Wolfe Hall in San Antonio (circa 1911). Courtesy of the Daughters of the Republic of Texas Library. Image available on the Internet and included in accordance with Title 17 U.S.C. Section 107. ST. MARY'S HALL. St. Mary's Hall was founded as a girls' school in San Antonio by Reverend J. J. Nicholson of the Protestant Episcopal Church in 1865. In 1866 the school closed because of a cholera epidemic, and the buildings were taken over for church purposes until 1875, when St. Mark's Church was completed. The Wolfe Hall campus on the corner of Navarro and Martin Street opened in 1865 as a boys’ school and later served as the first location of St. Mary’s Hall from 1866 to 1873. The property was then deeded back to Bishop Robert W. B. Elliott for school purposes, and in 1879 the school was reorganized with Phillipa G. Stevenson as head. The school was announced as the West Texas College for Girls. St. Mary's Hall Woodlawn Campus. Courtesy of the Daughters of the Republic of Texas Library. Image available on the Internet and included in accordance with Title 17 U.S.C. Section 107. St. Mary's Hall Motto. Image available on the Internet and included in accordance with Title 17 U.S.C. Section 107. By 1889 and 1890 St. Mary's Hall offered primary, academic, and college work. The school enrollment increased so greatly that a tent had to be used for classes. In 1889 Reverend James S. Johnston built Elliott Hall, and following years brought further increases both in enrollment and in physical facilities. In 1914 the downtown school was sold and a new site in the Laurel Heights neighborhood on the corner of Woodlawn and San Pedro streets opened in 1916. In 1921 the school included five departments; kindergarten, primary, academic, college, and vocational. In 1924 Ruth Coit became head, reorganized the school, and secured property at 117 East French Street known as the French Place campus. St. Mary's Hall was incorporated as a non-profit educational institution under the supervision of a twenty-five-member board of trustees. The new location included the school motto “Teach us delight in simple things,” appeared in bronze lettering on the stone steps of the school building, and later relocated to the new location. Coit organized an athletic association in the Upper school and formed two intramural teams named the Capers and Elliott after the founders. The school later formed the “Stirr Up Club” to promoted equestrian riding. In 1928 the school adopted and copyrighted an alma mater composed by Mabel C. Osborne. Later that year the school published the first edition of La Reata, the school yearbook edited by the students. On her retirement in 1937, the school name was changed to Ruth Coit School; it carried this name until 1940, when it resumed the former name. St. Mary's Hall French Place Campus. Image available on the Internet and included in accordance with Title 17 U.S.C. Section 107. St. Mary's Hall. Image available on the Internet and included in accordance with Title 17 U.S.C. Section 107. St. Mary’s Hall held the first annual Blue Tie Ceremony to honor seniors with ties and class rings on September 10, 1940. In the 1940s the school began holding an annual school festival, known as Fiesta. The San Antonio Academy purchased the French Place campus property in 1966. The parents, alumnae, trustees, and foundations, and others raised over $2.8 million to develop a new campus. 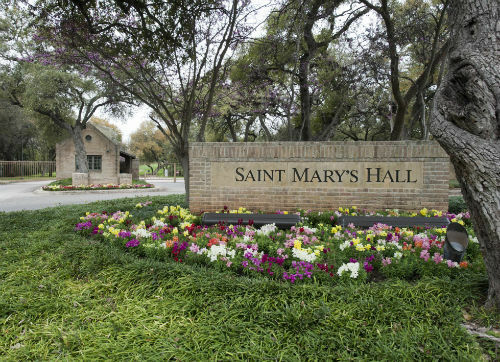 In 1968 the 300 students of St. Mary’s Hall moved to the sixty-acre wooded Starcrest campus in the northeast suburbs of San Antonio. 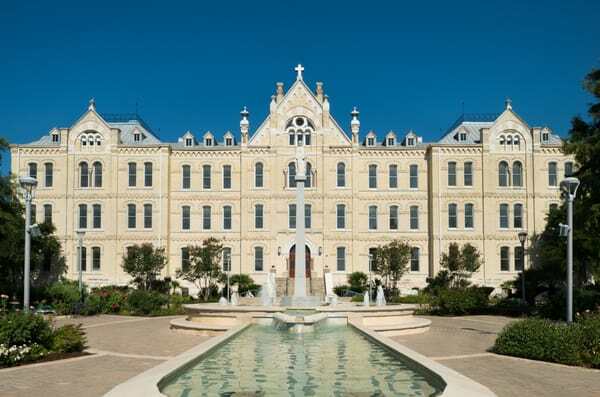 Its new facilities were designed by O'Neil Ford and Bartlett Cocke, who previously designed Trinity University. The school developed into a non-denominational co-educational day school and expanded to more than 950 students. The Board of Trustees commissioned an iconic clay tile quilt exhibit by artist Nancy Pawel that represented the history and traditions of the school. The Upper School began accepting male students in 1979 through a system of forms and fully implemented co-education in 1987. The school holds an annual fundraiser in the spring called Passport that features auctions and examples of student projects. St. Mary's Hall Starcrest Campus. Image available on the Internet and included in accordance with Title 17 U.S.C. Section 107. By 1994 school buildings included residence halls, dining halls, two libraries, a fine arts complex, a student activity center, and a sports complex. St. Mary's Hall offered a preschool Montessori program and a lower, middle, and upper school. The enrollment for the 1993–94 school year was 808, with 242 students in the high school. St. Mary's held accreditation from the Independent Schools Association of the Southwest. It was also a member of the National Association of Independent Schools and the College Board. In 1994 the school was coeducational and had an endowment fund of $16 million. It offered both a day school and a boarding school to secondary students. Boarding was on either a five-day or seven-day basis. In 2003 the school transitioned from a boarding school to a day school. Two years later the residence dormitories at St. Mary’s Hall converted into classrooms for the middle school. The campus includes a monument to the boarding students, the Residence Clock, which includes the names of three former alumni and four previous dormitories. Bell Tower at St. Mary's Hall. Image available on the Internet and included in accordance with Title 17 U.S.C. Section 107. In 2006 the school added the Marrs and Verna McLeans Library Complex, which includes the centrally-located and iconic St. Mary’s Hall companile known as the Bell Tower. The school did not have an official mascot until 2009 when a committee of students selected a warrior to symbolize inner toughness, grit, and determination. St. Mary’s Halls introduced a junior varsity football team in 2010, and initiated the “I AM” campaign that raised $25 million for six expansion projects at the school. By 2013 the campaign funded the Peggy Pitman Mays Dining Hall, Social Science and History Center, Alonso Ancira Event Center, McCombs Family Athletic Complex, Coates-Seeligson Theater and Chapel, and the Kim and Rod Lewis Track and Field. In 2015 the former head of St. Mary’s Hall, Bob Windham, created the Windham Fund for Excellence that raised more than $4.2 million to attract highly qualified faculty to the school. The Independent Schools Association of the Southwest (ISAS) approved the re-accreditation of St. Mary’s Hall in 2016. The school hosted the 49th annual ISAS Arts Festival that welcomed 3,500 students from forty-five school districts in five states. St. Mary’s Hall (https://www.smhall.org/about/at-a-glance/our-story), accessed April 13, 2018. San Antonio Evening News, August 14, 1922. San Antonio Express-News, February 3, 1974. Galveston Daily News, August 14, 1921. Handbook of Texas Online, Frances Donecker, rev. by Brett J. Derbes, "ST. MARY'S HALL," accessed April 19, 2019, http://www.tshaonline.org/handbook/online/articles/kbs47.